Call to Artists: What Ojai Means to Me an exhibit at the City of Ojai’s City Gallery. The City of Ojai Arts Commission is holding a call for artists for the City Hall Gallery. The exhibit is “What Ojai Means to Me.” Artists can submit up to 3 images and are asked to write one sentence on what Ojai means to the artist. A limited number of 3D work can be accepted. This exhibit is only open to residents of Ojai and the Ojai Valley. To enter, submit your entry below. Entry deadline is September 19 at 5:00 pm. Artists will be notified on September 21 by 5 pm. The top entries will be hung at the Ojai Valley Museum. A reception for the artists and the public will be held on 3rd Friday, October 20 from 5 pm to 7 pm. model for what so many other communities could be. 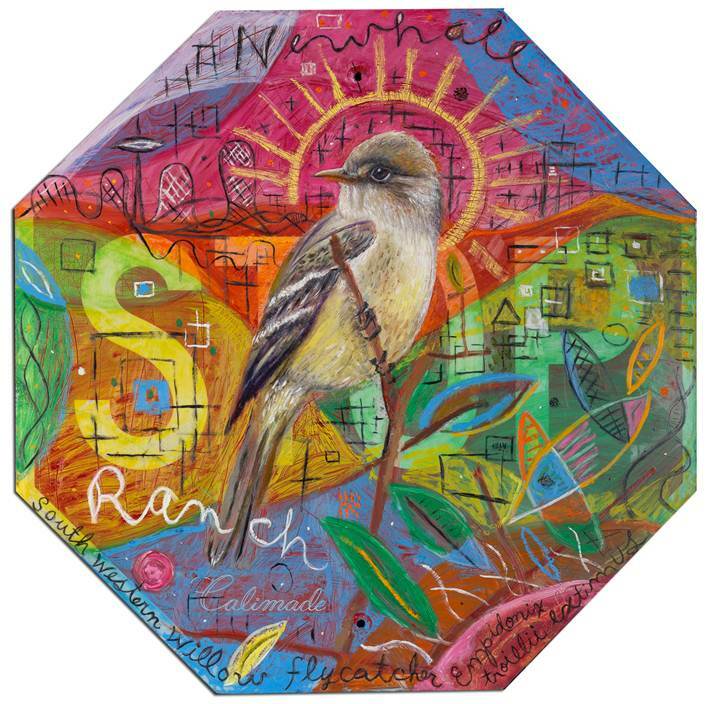 The City of Ojai’s Gallery is exhibiting the work of Dianne Bennett from June 26 – August 25, 2017. Her exhibit is dedicated to the animals whose livelihood is threatened by habitat and global climate change. “Once Upon a Watershed” is a children’s book that teaches children the value of living in harmony with the natural world. The story is illustrated with Bennett’s animal paintings and benefits the foundation of the same name. Bennett’s “California Quail” was purchased for the City of Ojai’s permanent collection in 2016. Growing up in the suburbs of Los Angeles when orange trees still outnumbered houses, I watched as meadows disappeared to asphalt boulevards, tracts and shopping malls. That experience inspired a passion in me for preserving and conserving wild, open spaces. In 2005 I began creating a series of portraits on salvaged metal advertising and road signs. My subjects are birds and other species threatened by loss of habitat and global climate change. The paintings are created in hopes of celebrating and illuminating the ephemeral quality and dignity of nature while raising questions about what we value, what we hold sacred and what is disappearing before our very eyes. I fell in love with the Ojai Valley when visiting my grandparents as a child. beings who share this beautiful nest. Go for a walk in the meadow today! Ojai’s newest additions to the City of Ojai’s art collection, will have an exhibit at the City Hall Gallery running from April 8, 2017 through May 19, 2017. A reception for the artists will be held on Saturday, April 8 from 4 – 6 pm. The public is invited. For more information about Richard Amend, visit his website. For more information about Wyatt Amend, visit his Facebook page. 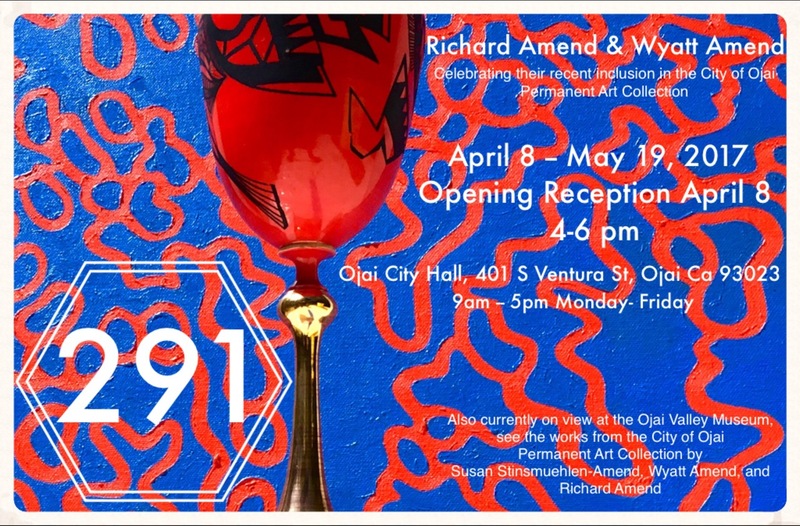 Richard and Wyatt Amend Gallery Opening at City Hall April 8, 2017. Reception for artists, 4 – 6 pm. (l to r) Arts Commission Chair Michael Addison; Richard Amend, painter; Wendy Barker, Ojai Valley Museum; Wyatt Amend, sculptor. The City of Ojai and the Ojai Valley Museum have forged a new element in their relationship which benefits both institutions equally and provides first class exposure for the work of Ojai artists. The Museum and the newly revived City Gallery will exhibit and show work at both locations at approximately the same time. Arts Commission Chair Michael Addison describes the relationship this way: the Commission is acquiring art all the time—such as Richard and Wyatt Amends’. But the City Gallery is small and storage is in the attic. “It’s a ‘win-win’ for artists,” said Richard Amend. The newly required pieces will be on display starting in mid-April in the Museum’s gallery. The Amends also have a show at the City Hall Gallery opening April 8 and running ‘til May 19. Two artists—two galleries. Win-win indeed!